This is a puzzle game with a difference. A teddy bear has stolen all of the monsters from the arcade games of every universe because he considers them to be evil. You play an arcade character yourself, and you must not only defeat said teddy bear, but also his wife and his child (who has an incurable urge to maim and\or kill anyone who gets in his way) while freeing the monsters. This is done by creating patterns of blocks by throwing matching blocks at them. Theoretically, you don't actually have to free any monsters, but you do have to clear all of the blocks on the level to continue, and often there is a trick to doing so, such as some of the blocks being a part of the environment, or set up as a trap. You can often spend ten minutes on a level before realising this, and the same trick is almost never used twice, making many of the levels quite difficult, but also keeping the game, which is 160 levels long, from getting old, but not entirely successfully. Throwing blocks can get tiring after 20 levels or so. The game also features a level editor that is relatively easy to use, but the sheer number of buttons and modes can make it seem a little daunting at first. The graphics are equivalent to your average side-scrolling puzzle game, and the art style is very cartoony, which makes it quite a surprise when you lose and your character pulls out a gun and shoots himself. This can be censored, of course, but it ruins the unusual and occasionally disturbing atmosphere of the game (set up, I might add, by the Accursed Toys logo, which is a stabbed and bleeding teddy bear). There are a huge number of different art styles between levels, from a weird natural\technological fusion, to temple-ish levels, to levels that are scribbled on refill paper in blue ink, and this gives the game quite a disjointed feeling. The sound is of a reasonable quality, although a little sparse, and the music is cheerful and suits the art style of the game. 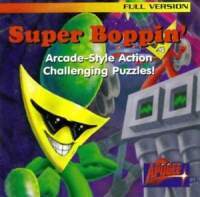 Overall, Boppin is a good game. Good, but nothing other than the art and story of the game really puts it above any other puzzle games, and many other puzzle games are both more challenging and more engaging. It can often be frustratingly hard and frustratingly easy, but also deceptively frustrating, and the developers have gone a long way to give the player a smart way to solve many of the puzzles. In 2005, the authors recompiled the game as freeware for Windows, adding the sounds of the version for Commodore Amiga.